Despite the best efforts by astronomers who voyaged to far flung reaches of the Earth to watch the transits, the results of the observations was not as conclusive or accurate as had been hoped. The observations were plagued by many technical difficulties, and by the slightly fuzzy outline of Venus, caused by its dense atmosphere. There was also an unforeseen problem with a phenomenon known as the ‘black drop’ effect. One of the chief problems the observers faced was pinpointing the precise time of ‘second contact’, when the whole of Venus was first visible on the face of the Sun. They noticed that its black disc seemed to remain linked to the edge of the Sun for a short time by a dark ‘neck’, making it appear almost pear-shaped. 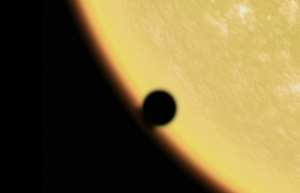 The same happened in reverse when Venus began to leave the Sun. Click for an animation of the black drop effect. This so-called ‘black drop effect’ was one of the main reasons why timing the transits failed to produce consistent accurate results for the Sun-Earth distance. Halley expected second contact could be timed to within about a second. The black drop reduced the accuracy of timing to more like a minute. The black drop effect is often mistakenly attributed to Venus’s atmosphere, but modern research has suggested that it is due to a combination of two key effects. One is the image blurring that takes place when a telescope is used (described technically as ‘the point spread function’). The other is the way that the brightness of the Sun diminishes close to its visible ‘edge’ (known to astronomers as ‘limb darkening’). There may also be a small contribution from observing through Earth’s atmosphere, but observations of the black drop effect during Mercury’s 1999 transit across the Sun using NASA’s TRACE satellite confirmed that neither the planet’s nor Earth’s atmosphere is needed to produce the effect. Despite the disappointments of the 18th century expeditions, optimistic astronomers tried again during the transits of 9 December 1874, and 6 December 1882. Once again the results were inconclusive, and scientists began to realise that the practical problems with Halley’s method were just too great to overcome. Nevertheless, the value of the Sun-Earth distance was known with much greater accuracy than ever before after the results of the 1882 transit were analysed. This entry was posted in Transit of Venus and tagged Black drop, Calculating distances, Historical transits. Bookmark the permalink.